Just over a week ago, we gathered with immigrant families and faith leaders at a church in downtown Los Angeles and listened to stories of those swept up in recent raids, including Romulo Avelica who was arrested in front of his daughter on the way to school. 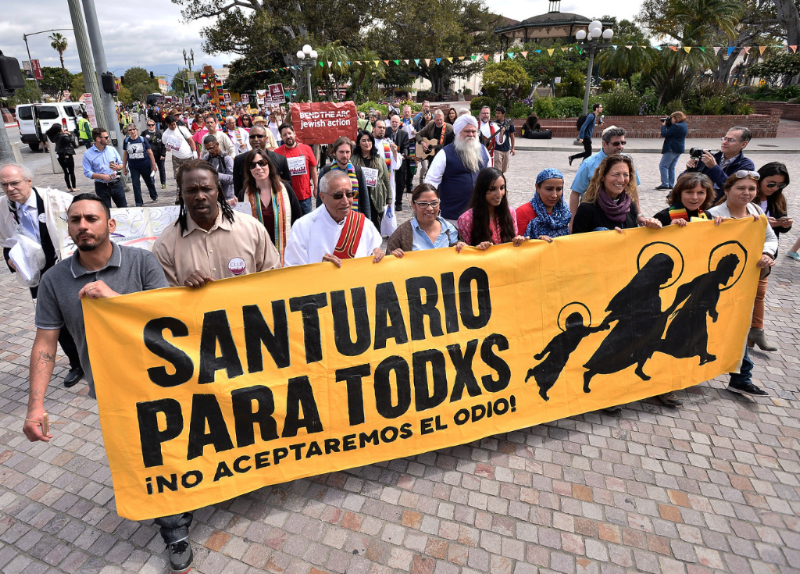 In their name, we marched from the church to the local immigration detention center in song, music, and rituals for Passover, Easter, Lailat al Miraj, and Vaisakhi. Then it happened. During our protest, we began to hear sounds from high above us. Detainees were banging on the windows of their cells to say: We are here; We hear you.Gazing up at their cells, we began to clap in rhythm with them. Then we broke into song: La Bamba! We serenaded them, and time stopped. We shared a moment of joy that transcended the walls that separated us. We laughed and wept. You can watch this moment happen live halfway through my Facebook Live broadcast here. Moments later, 35 of us, faith leaders, activists, and family members, linked arms and blocked the driveway into the detention center in an act of nonviolent civil disobedience. You can hear our voices and watch the arrest on this beautiful short video, thanks to our lead partners at CLUE, Bend the Arc and Episcopal Sanctuary Task Force. It was #RevolutionaryLove in action. As we approach 100 days of resistance, I have felt fatigue set in. But this moment returned me to Chardi Kala, the Sikh spirit of ever-rising high spirits even in darkness. It was a powerful way to commemorate Vaisakhi, a time when Sikhs renew the commitment to walk the path of our Gurus, who taught us to fight oppression with body and breath. Here is why I believe that in a time such as this, Revolutionary Love calls for moral resistance, including civil disobedience. So tonight, tomorrow, and this week, we invite you to find strength and resilience in community in the spirit of Chardi Kala. See below for a list of upcoming events, including the Revolutionary Love Conference this weekend. We want to hear about your most life-giving moments in the first 100 days. Please post with the hashtag #RevolutionaryLove #100Days and we will share. However you spend this week, may you draw upon sources of love that center you. KEYNOTE: WOMEN WARRIORS: “REVOLUTIONARY LOVE IN AN ERA OF ENORMOUS RAGE” WITH VALARIE KAUR, DUKE UNIV (TONIGHT, APRIL 24): As part of Duke Chapel’s Finding Sanctuary speaker series, students and community members are invited to Valarie’s keynote tonight on confronting hate, racism, and nationalism with love as a public ethic. If you can make it, please reply to this email so that we can look out for you! Here are details to attend tonight’s event. DIALOGUE: “ONE COMMUNITY: TOGETHER IN SOLIDARITY” WITH VALARIE KAUR, KANSAS CITY (APRIL 25): Tomorrow night, Valarie will deliver a keynote in Kansas City, where Srinivas Kuchibotla was murdered on February 22nd. In his memory, please join us for a community dialogue to process grief and moral outrage and renew our commitment to love and justice. Please reply to this email so that we can look out for you. Details Find details to attend tomorrow’s event here. THE REVOLUTIONARY LOVE CONFERENCE, NYC (APRIL 28-30): To mark 100 days of our moral resistance, we invite you to attend the Revolutionary Love Conference this weekend. We are co-hosting the conference at Middle Church in NYC with the Rev. Dr. Jacqui Lewis. Valarie will join Bill Moyers, Van Jones, Rev. William Barber, Brian McLaren, and many more on the role of the ethic of love in our movement. We have a sliding scale down to zero available for activists who want to join us! Just reply to this email. See the schedule and register for the conference with the discount BREATHEPUSH here. KEEP THE PROMISE TO THE COAL MINERS (APRIL 24-28): Our beloved partners at #LoveArmy are calling upon Congress to protect the health benefits of 20,000 coal miners and the pensions of over 90,000. If we don’t take action now, we will set a precedent by saying it’s okay to take away benefits from teachers, nurses and more. Watch Love Army founder Van Jones speaks passionately on this here. Here is how to help pass the Miners Protection Act. PEOPLE’S CLIMATE MARCH, DC (APRIL 29): The Revolutionary Love Project is proud to announce our support for the People’s Climate March. We will be honoring the march at our conference and standing in solidarity with marchers in DC and sister events across the country. Here are opportunities to volunteer for the march. RSVP for the march here. #NOMUSLIMBANEVER WEEK OF RESISTANCE (MAY 8-15): On January 27th and again on March 6th, the Trump Administration issued executive orders that barred travel from six Muslim-majority nations and suspended the refugee program for 120 days. After federal judges in Hawai’i and Maryland blocked significant parts of the order, the federal government appealed. Hearings are scheduled for May 8th in the Fourth Circuit Court of Appeals (Richmond, VA) and May 15th in the Ninth Circuit Court of Appeals (Seattle, WA).We are supporting a week of resistance with our partners. Here are five ways you can join,the week of resistance wherever you are in the country. VETERANS FOR PEACE “BUILD FOR PEACE” RALLY, DC (MAY 30): If you are in DC, we urge you to attend this rally by Veterans for Peace. Thought leaders will speak in opposition to this administration’s policies, including dynamic young veterans who have seen directly the folly and futility of war. They will present on the need for love and justice here at home and abroad. Sign up for the rally here. SRINIVAS’S LAW: The Revolutionary Love Project supports this petition to encourage the Kansas State Legislature to pass a hate crime statute and name it in honor of Kansas-based engineer Srinivas Kuchibhotla, whose killer interrogated Srinivas on his immigration status and yelled “Get out of my country” before taking his life. HATE EVENTS TRACKER: Collecting stories about hate violence and bias-motivated incidents is difficult but necessary to ensure that victims have access to resources and advocates can advance prevention. That’s why we are proud to support the Muslim Advocates Communities Against Hate initiative to track and respond to hate incidents together and connect survivors to a host of social and legal services. Visit the initiative here. HATE CRIME REPORTING HOTLINE: The Lawyers’ Committee has run an Election Protection Hotline for over a decade, and as part of the Stop Hate Project, launched a resource and reporting hotline for hate incidents 1-844-NO-HATE. Individuals and community groups that call the hotline will receive resources they need as they leverage their national network of pro bono attorneys, connect callers and victims of hate to organizations, mental health services, and in appropriate cases, provide access to counsel.